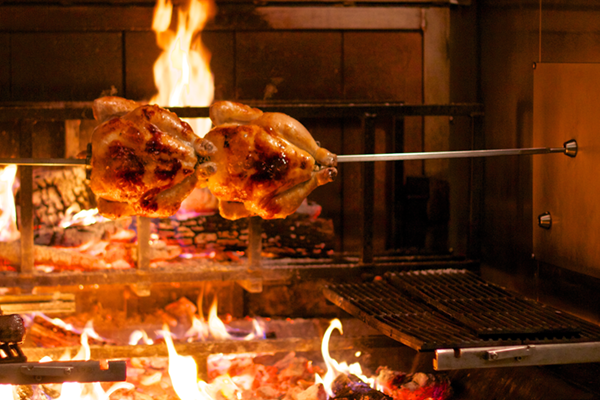 PHOTO: The organic rotisserie chicken takes center stage at Republique. 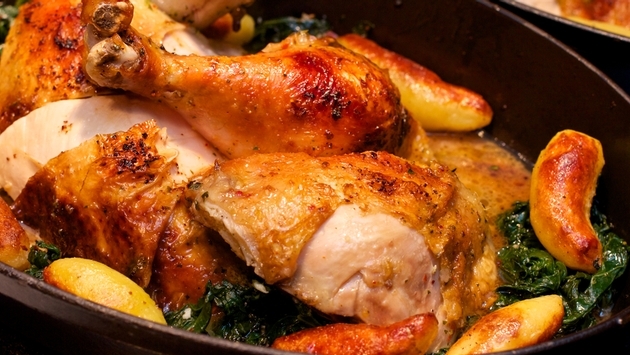 Winner, winner chicken dinner, in celebration of Chicken Month we’d like to take you on a tour of the best chicken dishes across the United States. 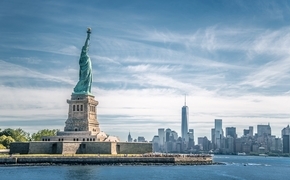 Starting in Los Angeles and venturing toward the East Coast, we’ll introduce you to some of the most mouth-watering fried, rotisserie, barbecue and wings recipes in the nation. 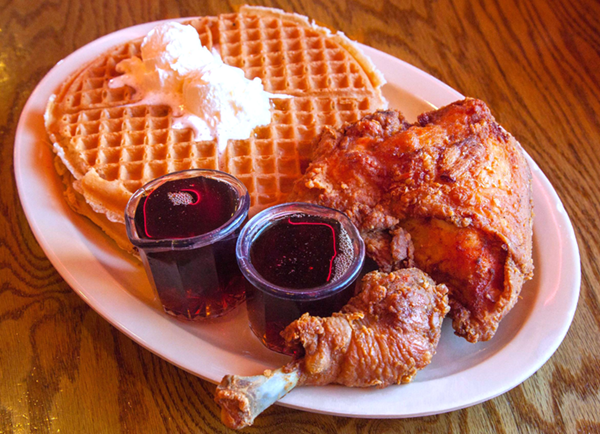 A list of the best chicken dinners in Los Angeles wouldn’t be complete without the inclusion of Roscoe’s House of Chicken and Waffles, a mainstay since 1975. Inspired by the legendary Wells chicken and waffles joint of Harlem, Roscoe’s earned its fame by doing what successful Hollywood-types do best—get the bigwigs talking. Word first spread through Motown and by a few television stars of the ’70s, such as Red Foxx, and later via Snoop Dogg and three U.S. Presidents, including Barack Obama who has a menu item named after him. With just the right amount of tender crunchiness to go alongside two massive buttery waffles, it’s surprising this dish doesn’t have its own star on the Walk of Fame. Believe it or not, the Spanish-Moroccan architectural influences on the face of République’s 1929 building, which once served as Charlie Chaplin’s office space, and the soaring ceiling and towering gothic arches of the main dining room are not the establishment’s main attraction. Owned by a husband-and-wife duo, chefs Walter and Margarita Manzke, along with restaurateur Bill Chait, République offers modern French-inspired cuisine that would taste just as brilliant served in a shack without windows. The moules frites are truly outstanding, but we tend to think the restaurant’s raison d’être is their perfectly juicy organic rotisserie chicken, served with a variety of fresh, farm-to-table vegetables, which can change daily and have included summer succotash, kale and fingerling potatoes. My 2 Cents is by far one of the best under-the-radar restaurants in LA. Every item on the rotating menu of this charming, soul food establishment—from fried catfish, to Creole shrimp & grits, to seafood gumbo, and quinoa macaroni & cheese—is made to perfection with local-grown, organic ingredients. Since its 2013 opening in the up-and-coming Mid-City area, My 2 Cents has become well known and loved by neighborhood foodies, who on occasion can be found chatting with the owner and chef, Alisa Reynolds. Depending on the time of day and the day’s fixings, the BBQ Fried Chicken can be served with an egg baked right into it, or with a side of boiled eggs and sweet potato hash, or on a brioche bun with apple cabbage slaw. Need we say more? Going a few welcomed steps beyond the gourmet burger trend, Umami Burger’s former executive chef Ernesto Uchimura opened his first Plan Check Kitchen + Bar in West LA’s Little Osaka neighborhood in 2012. Since then, Los Angelenos have waited patiently for expansion restaurants to open in the Fairfax District and Downtown. The reason? The most obvious answer is Uchimura’s burgers. But once you get past the hype and nostalgia of beef patties as your All-American comfort food and try the Southern Fry sandwich with its crunchy, yet tender smoke-fried Jidori chicken glazed with spicy green pimento cheese and topped with succulent duck breast ham and pickles, you’ll have an irresistible urge to return again and again. When husband-and-wife team Jimmy and Yume Han opened their Koreatown establishment in 2011, they didn’t anticipate such a generous crowd of craft beer enthusiasts. After all, the area was known more for its karaoke scene, Korean barbecue and housing The Wiltern Theater. Aside from Beer Belly’s regular turn over of ales, lagers, IPAs and DIPAs, one menu favorite is chef Wes Lieberher’s Jidori Hot Wings, which come in three flavors and levels of heat. The superstar of this place is the super-spicy Volcano Chipotle wings with Sriracha, Tabasco, cayenne pepper and crushed red pepper, served with an aioli blue cheese dip. 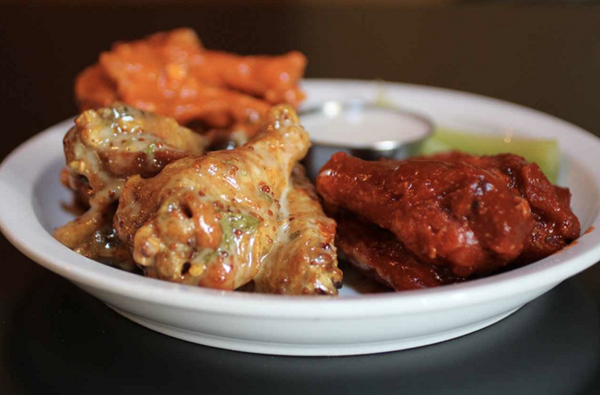 But you can’t go wrong with the traditional Buffalo Blue wings or the mildly spiced Honey Dijon and Cilantro.